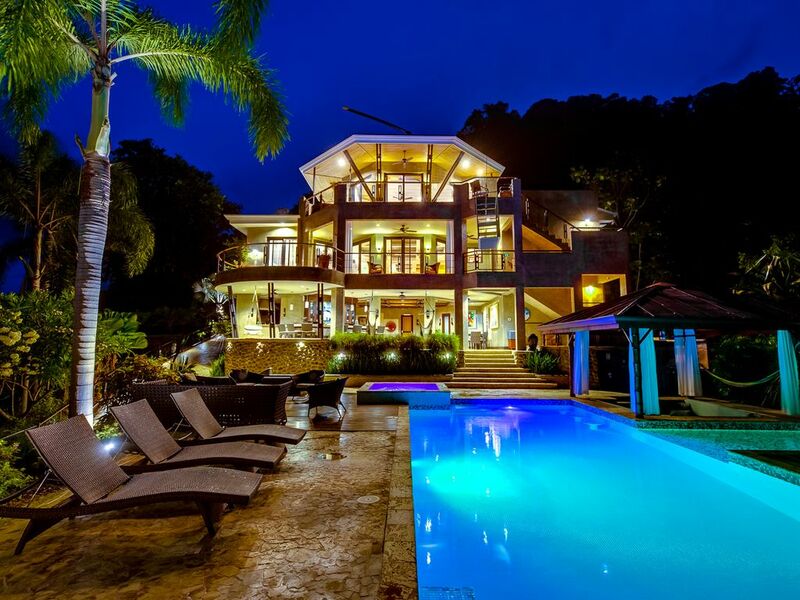 Vous cherchez une villa de vacances de luxe au Costa Rica? Ne cherchez pas plus loin que les villas à Punta Gabriela. Cette propriété de 7500 pieds carrés est pour le vacancier aisé qui apprécie les meilleures choses dans la vie. Aucune autre station revendique le niveau de la vie privée, du paysage et du confort. Niché confortablement le long de la forêt tropicale côtière de Dominical dans le Pacifique Sud du Costa Rica. Entouré par la jungle luxuriante et vue à 180 degrés sur le Pacifique. Caractéristiques: 4 suites luxueuses, la maison principale et «l'espace social». Trois des villas sont détachées de la maison principale et de la 'zone sociale', tandis que la villa 4 (The Penthouse) est située au troisième étage de la maison principale. Toutes les villas offrent la même expérience de luxe, chacune d'une superficie de 550 pieds carrés, kitchenette et salle de bain privée. Villa # 1 a également sa propre piscine privée et un jacuzzi et une longue terrasse surplombant l'océan Pacifique. Villas # 2 et # 3 ont de superbes vues sur l'océan Pacifique et les jardins environnants. Villa # 4 (The Penthouse) se trouve au troisième étage avec trois grandes portes vitrées qui s'ouvrent sur la mer incroyablement belle. Le balcon dispose d'une douche extérieure et d'un bain à remous. Une cuisine gastronomique, que vous pouvez utiliser pour cuisiner pour votre fête, ou réserver notre chef sur place pour cuisiner tous vos repas. Un bar avec télévision et ventilateurs de plafond stéréo vous garder au frais tout en regardant la belle piscine et le magnifique océan Pacifique. Une grande piscine et un jacuzzi avec des sièges ombragés dans le gazebo, et une terrasse ouverte pour profiter du soleil. Un espace barbecue à l'emplacement idéal près de la terrasse de la piscine, ce qui crée une atmosphère confortable pour socialiser et cuisiner avec la famille et les amis. Beaux jardins dans toute la propriété contenant les plantes les plus exotiques originaires du Costa Rica. Une plate-forme d'arbre one-of-a-kind qui surplombe l'océan Pacifique et se connecte à notre tyrolienne privée. Un Heli-Pad situé au-dessus du Penthouse, qui permet aux clients d'être pris en charge sur place pour des visites guidées de la forêt tropicale environnante et de la côte. Oudoor douche, portes de verre teintées, eau chaude, serviettes, sèche-cheveux. This resort is simply incredible and magical! The staff is great and super helpful. Really beautiful people! The villas are spectacular and so it’s the view, the pool, the small zip lining in the property, the fauna and the flora. I recommend it for groups, families, and couples. Basically for everyone who is looking for a luxury experience. Also, they make the best pancakes ever with mango inside! This is truly a luxury property. You get so much compared to other places I stayed at in Costa Rica. It was very clean and well maintained. The staff cooked us amazing food and made the best pina colada’s. Edwin was very helpful and friendly. The views are amazing and the whole place is very picturesque. The zip line added a lot of fun and offered a great view of the stars. I hope to stay here again! The property was breathtaking! Truly magestic. I arrived by helicopter onto the pad built on top of the villa. That was such a once in a life time experience. The views were insane! I was offers a tropical refreshments opon arrival and my bags were taken to my room. I can’t say enough good things about this experience. Everything from views to the rooms were so clean and beautiful. The outdoor shower with ocean views really made taking a shower so peaceful and calming. I will say my favorite thing about the place was Edwin. He is the house cook and everything else you need or want he takes care of. He is great and very accommodating. He made sure everyone was happy, full, and wanted for nothing. I highly recommend the stay here and will definitely be coming back. It’s a true paradise! I got a chance to meet the owners and they are super kind and they gave us great advice on where to eat and site see. Best vacation ever! So happy I got chance to meet everyone and can’t wait to see you next time you come back. From the moment we arrived we knew we were in the right place. Traveling as a group of 12 friends celebrating a 50th birthday, this was the perfect gathering spot. The rooms and villas were beautiful, the pool and common area perfect for dining, relaxing and reading. Edwin and the rest of the staff were wonderful. Always there to help, guide and make our stay perfect. The food was fantastic - clean, flavorful and delicious. We highly recommend adding this service to your stay as it was preferred over any restaurant. We enjoyed snorkling, ATV tour and zip lining close by but enjoyed being at the pool, watching the monkeys play in the back and just relaxing. Thank you Jesse and Edwin for making it so easy and helping us celebrate a special birthday with a band, cake and decorations. We would highly recommend and we all hope to be back soon! We are so happy that veryone had a great time and that we could be part of it. Thank you for the kind words about bot the property and our staff. We all strive to exceed your expectations and looks like we did it again. Looking forward to seeing you in the future. We had an unforgettable first trip to Costa Rica to celebrate a good friend's 50th birthday. Our friend who planned the trip could not have chosen better. I kept thinking that anyone would be so lucky to have spent their 50th there. The property is absolutely gorgeous - well designed group of accommodations where all 6 couples had spacious, private spaces with beautiful landscaping and unbeatable views. I think what made it extra special was the group of staff working there making sure all of our needs were met. Edwin, the house manager extraordinaire, made sure we were well fed and happy. We started the day with a delicious breakfast he made and then depending on the day lunch and dinner also made by him. The best meals we had on this trip were right at the house. He is an absolutely wonderful and kind person who always had a smile on his face. He also set us up with excursions that were fantastic. Snorkeling, zip-lining, ATV tour were all an absolute blast. It was a completely relaxing trip because he took care of it all. Of course, that wouldn't all have been possible without the other staff who were also awesome - Consuelo, Willie, Minor, Andrey and Liz. No shortage of smiles from everyone and they were all very hardworking. My husband and I wished that we could take Consuelo home with us! I was always happy to see her in the kitchen in the morning, big smile on her face. We just left a couple of days ago and already miss our nightly sunset dips in the infinity pool. I'm not sure I'll ever experience a more beautiful sunset again...until I come back!